This 2 piece quilt set is perfect for you if you like colorful mountain meadows. The table topper finishes at 32" square and the throw is 56" x 62". 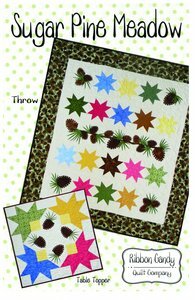 Simple pieced blocks and fusible applique make this quilt go together quickly. All the templates are full size and ready to go. The instructions are very detailed and have diagrams.